الخيار الأفضل للحصول على المتعة والاسترخاء, Quest Potts Point Hotel يقع في منطقة Potts Point في سيدني. يمكن من هنا للضيوف الاستمتاع بسهولة الوصول إلى كل ما تقدمه هذه المدينة النابضة بالحياة. يضفي محيط الفندق اللطيف وقربه من Kings Cross Inner City, الالامين فونتن, ‪Kings Cross‬ سحراً خاصاً على هذا الفندق. ببساطة كل الخدمات وأساليب الضيافة التي تشتهر بها Quest Serviced Apartments تجعلك تشعر وكأنك في بيتك. يقدم هذا الفندق العديد من الخدمات الكفيلة بإرضاء أكثر الضيوف تطلباً. في Quest Potts Point Hotel غرف نوم يزيد عددها عن 70 صممت بذوق وعناية لتوفر لك كل وسائل الراحة . بعضها يحتوي أضاً على تلفزيون بشاشة مسطحة, سجاد, قهوة فورية مجانية, شاي مجاني, بياضات. يقدم الفندق مجموعة رائعة من الخدمات كمثل حديقة، لجعل إقامتك تجربة لا تنسى. يحظى فندق Quest Potts Point Hotel بموقع ممتاز وخدمات يصعب منافستها. Friendly staff, close to everything. Need to upgrade to add restaurant. Garage in an interesting place. Would be nice to have it closer to the hotel, but it was nice knowing the car was in a secure parking garage. 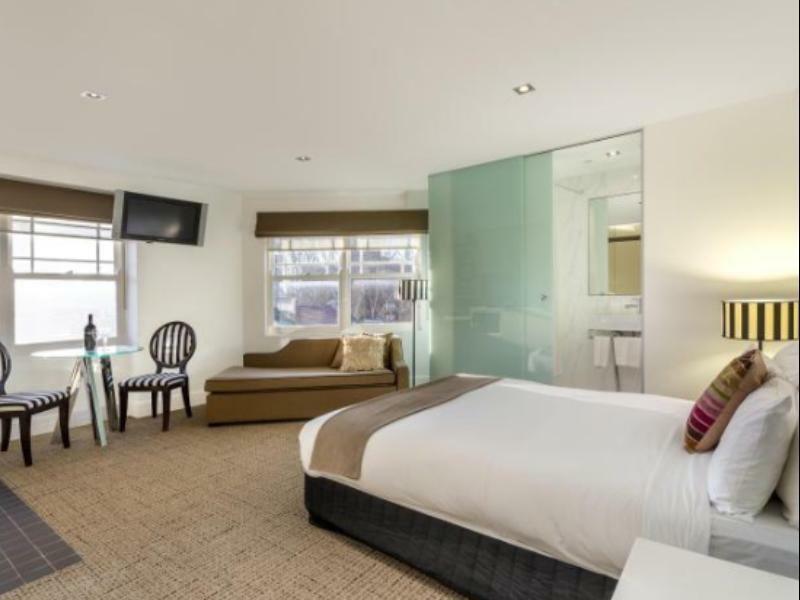 The very friendly and helpful staff made our stay in the Quest Potts Point memorable. Our room had an appropriate size, the kitchenette was very useful and well equipped. However, the bathroom is very small and the installation of the shower such, that we needed many towels. If you are there, you should definitely check out the rooftop terrace. Helpful staff however, found 2 holes on my bedsheet and I got invoiced for drinks and snacks even though I didn't touch any of their mini bar food. They also didn't supply any toothbrush, tooth paste or comb, which I thought all 4 stars hotel would. Thankfully I brought my own! My wife and I were a bit disappointed overall with the room. We liked the style of the room, but it was quite small. Wifi should have been better, and we had an aircon that didn;'t work well and leaked (made for a wet carpet near the door... and getting dripped on when we wanted to go out). This would have been ok if the staff would have taken us seriously when we mentioned it to them. They just didn't seem to care. We had a couple extra nights to stay and stayed a block away at the Regency and loved the room there. For a cheaper price we had a huge room. I will say that I loved that they had free laundry services here... a huge plus! 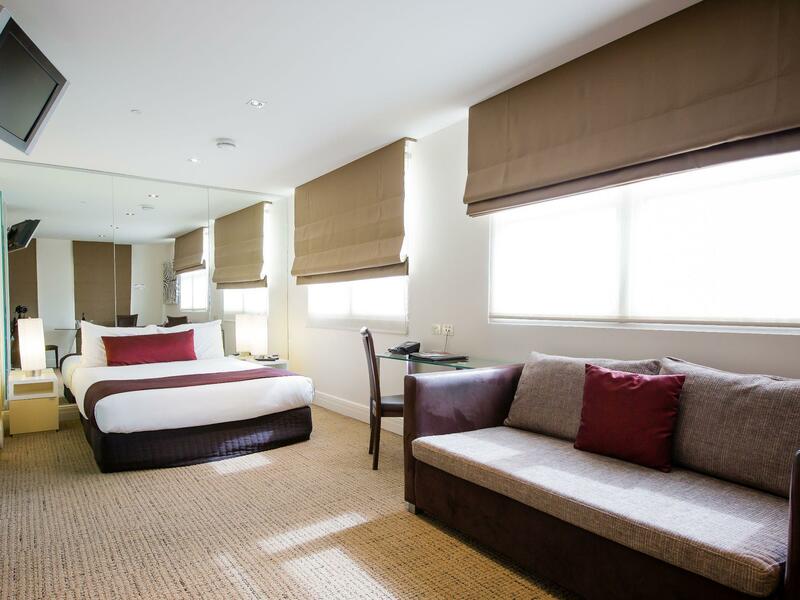 Situated 200 meters from train station in quiet area, but near King's Cross is an ideal place to stay in Sydney. No breakfast was available, but some nice café with breakfast possibilities near hotel. Hotel staff performance was really nice and friendly. Great stay. 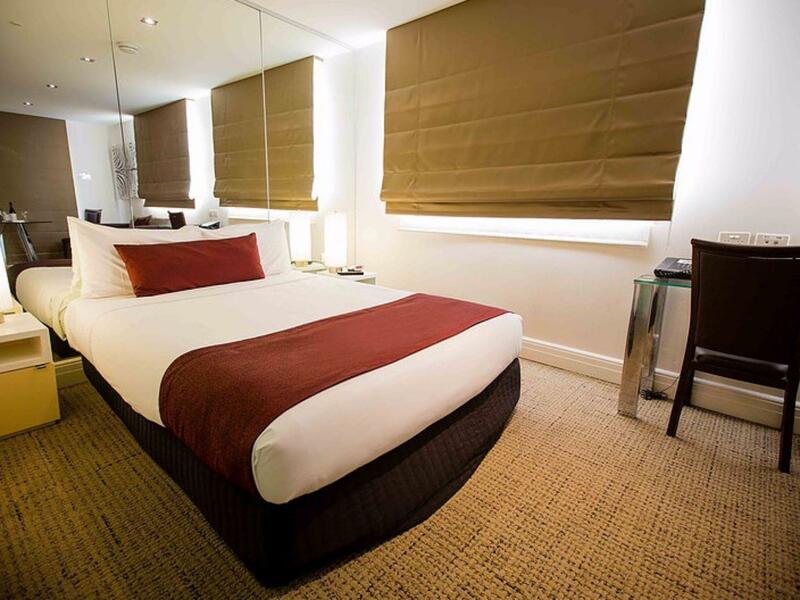 Location is good as it is very near the King Cross station; Room is clean and has a small kitchen area. Satisfied with the stay. I was able to check in early like 9+am (a pleasant surprise) and the staff is helpful. It is well located, near to King Cross station (get out at Victoria St, walk towards Earl St and follow the road. Quest is at the end of the street). Wifi is not entirely free (limited to 300MB per day) and the signal in the room is kind of weak. The room i had is pretty big with a small kitchen area, and the bathroom is big (the shower area is divided by a curtain - not an issue though). If not for the weak Wifi signal and limits imposedm i would have given Quest Potts Point a higher than 7.5 rating. All of our guest feedback helps us to ensure we are on track and providing the best possible service and experience to each and every one of our guests, I appreciate you taking the time. 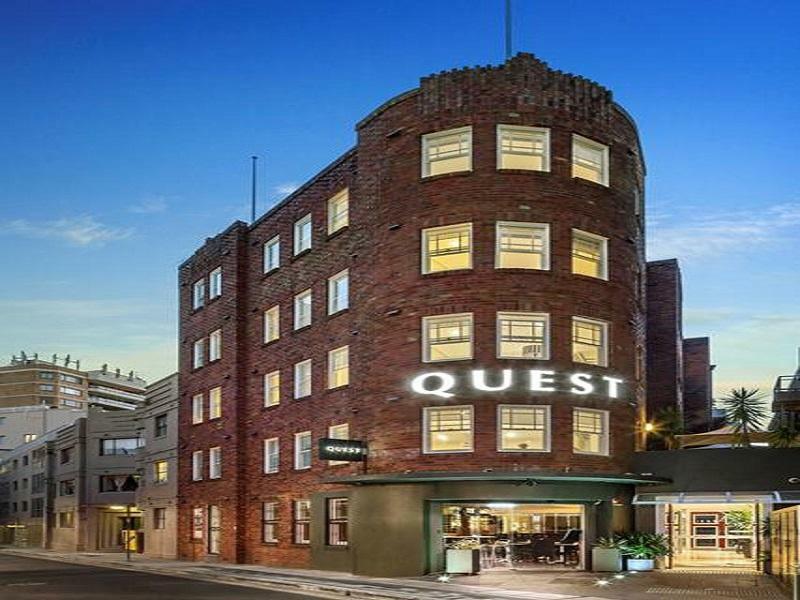 Over the years I have stayed several times at Quest Potts Point - main reason is for it's excellent location close to Kings Cross Station and the many of fabulous restaurants and coffee shops in the area . Staff are always helpful and friendly . Highly recommended . Depend on what you are looking for. Size or VFM. Shower and toilet slightly small compared to other hotels but at least not shared. Location great and convienent for travelling around the city landmarks. Kings Cross station just round the corner and within walking distances of the Tower and Circular Quay. Lots of food joints and night life if you are an night owl looking for entertainments. We had a very pleasant stay and I would highly recommend this hotel. We arrived the morning of NYE and the staff did a great job accommodating our early arrival. They promised to have a room ready shortly after our arrival so we took the time to explore the neighborhood, picked up a few groceries at the very convenient and lovely store across the street and made it to our room in time for a nice nap before heading out for our NYE plans. The rooftop is not to be missed - we had a lovely picnic and enjoyed the view. They have an excellent complimentary coffee machine for their guests that I wish I could have taken home. Quest Potts Point has become our regular Sydney Hotel. Right in the middle of Kings cross/ Potts Point, but just off the very busy main road. A freshfood grocery shop opposite, pubs, cafes and restaurants surround it, but if we just wanted a quiet night, we grab a pizza and take it up to the rooftop and have a fabulous view of the Sydney harbor bridge and opera house. The train station is just 2 minutes away. The rooms are fairly smallish, but clean and contain their own mini kitchen. The staff are friendly and helpful. Will be booking again for next year! The stay was ok but we were not prepared for how small the rooms were. The first room we could hardly move (think Tokyo) and we were allocated a room right by the lift. In the 15 minutes we were in the room we heard every conversation outside our room while people were waiting for the lift. We asked to be moved and were allocated another larger room on the ground floor which was much quieter although we were awoken at 2am by other guests returning from a night out. The walls are very thin.The staff are great and the wifi from our ground floor room worked just fine. The location is great although I did not expect to see people urinating in the street opposite at 9am Sunday - this is more of a Kings Cross issue. Location, comfort, great roof top. 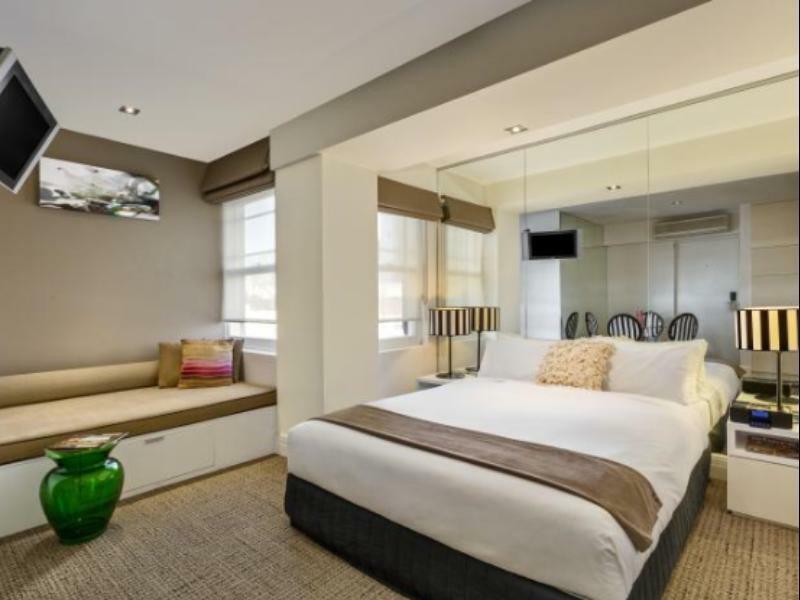 Really enjoyed our stay at Quest Potts Point Hotel. Great location 3 minutes away from Kings Cross Station, staff polite and helpful, there is a great grocery store across the road, plenty of great cafes/eating places around the hotel and a lovely roof-top garden area with the most amazing views of the Sydney harbour. Rooms small, but clean with a kichette. Would recommend. Overall space is limited but accept this in view of price. Wish there was a few minor additions, like hooks behind bathroom doors to hang towels/clothing. Staff are extremely pleasant and helpful. 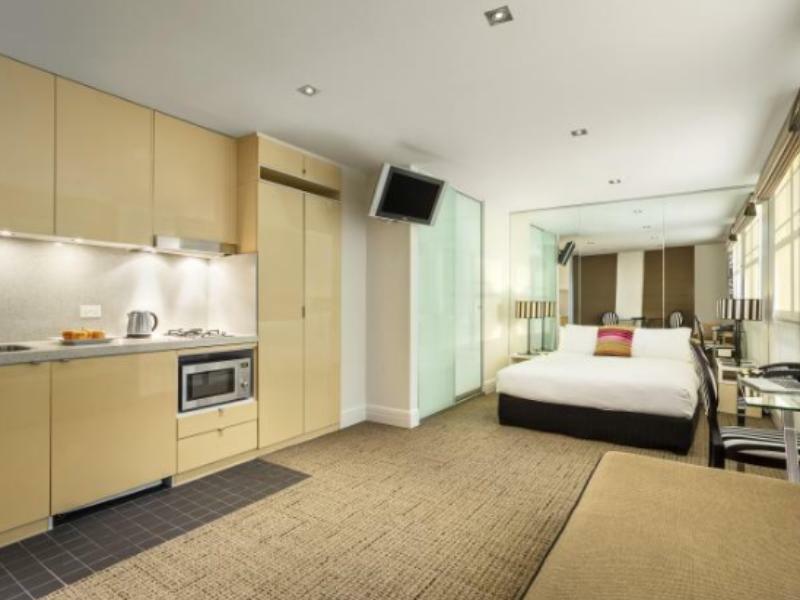 I have stayed a number of times at Quest Potts Point - great location and always clean , polite staff but rooms are small for the price . I found it very odd that the room was not serviced on Sunday - what happens for check out / check in rooms on a Sunday !